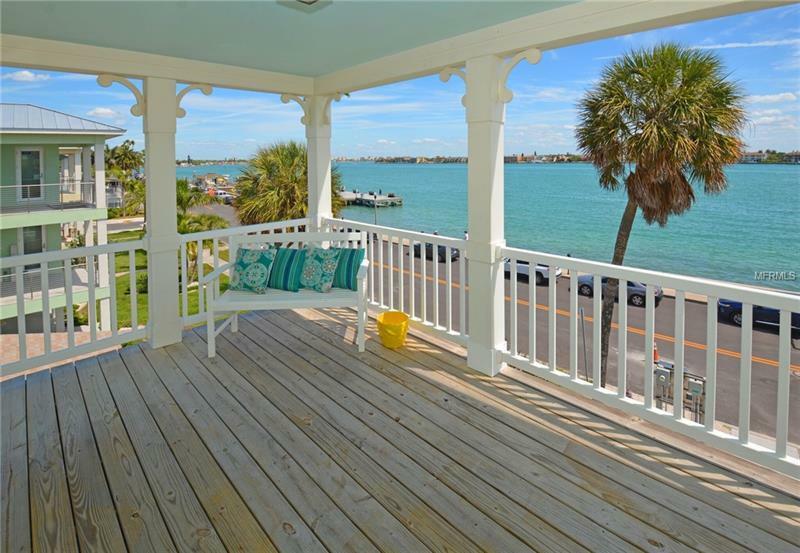 Enjoy the Coastal Living Lifestyle in this beautiful Key West Styled home in the Heart of Historic Pass-a-grille Beach. Feel like you are on vacation every single day in this Spacious Three Bedroom Home. Overlooking Pass-a-grille Channel on the Intracoastal Waterway, this home is just steps from the sugar sand beach and the Gulf of Mexico. Panoramic Views of the Pass-a-Grille Channel from the Living Room, Dining Room and Master Suite. Covered Porches on every level are bathed in morning light and salty breezes. The Open Kitchen has an Island Breakfast Bar and walk-in pantry. The family room stretches across the back of the home, creating two separate but open seating or entertaining areas overlooking the Pool and Garden. The third level presents the Master Suite with walk-in closet, cozy seating area and a private porch overlooking the Channel. The second and third bedrooms are spacious and bright with views of the Gulf of Mexico. A cabana room with half bath provides a cool retreat on the ground level. The outdoor shower is a great place to rinse off the beach before cooling off in the Private Pool. Three Car Garage provides protection and storage for vehicles, golf carts, bikes and beach toys! This home is Move-in Ready!